Before I go any further - I must tell you I'm typing with one hand. I have burned my right hand, in multiple places, with a hot glue gun. I guess with as often as I use the hot glue gun the odds were high that I would be burnt one day. Now - onto the reason last week was terrible on Kiss My Smash. Over a week ago - I decided to embark on a project that I've been dying to do! 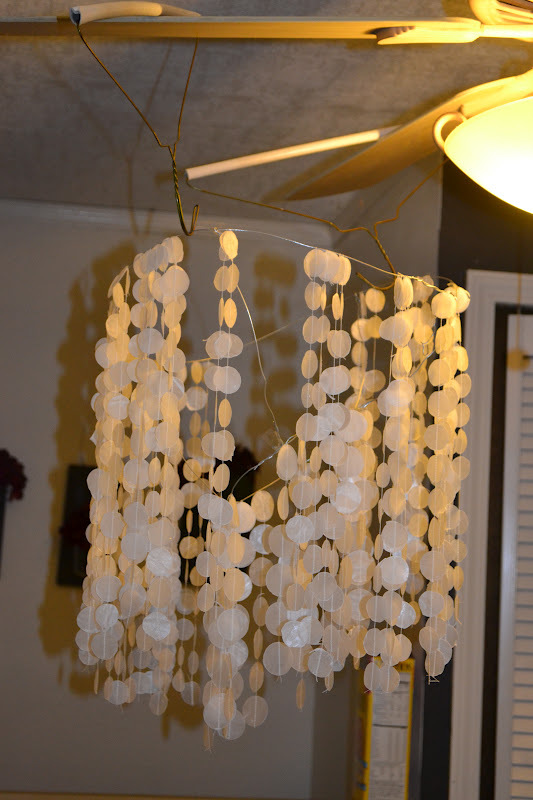 I was inspired by the DIY Capiz Shell Chandelier at Freshly Picked. Check it out before you read any further so you know exactly what I was going to imitate. 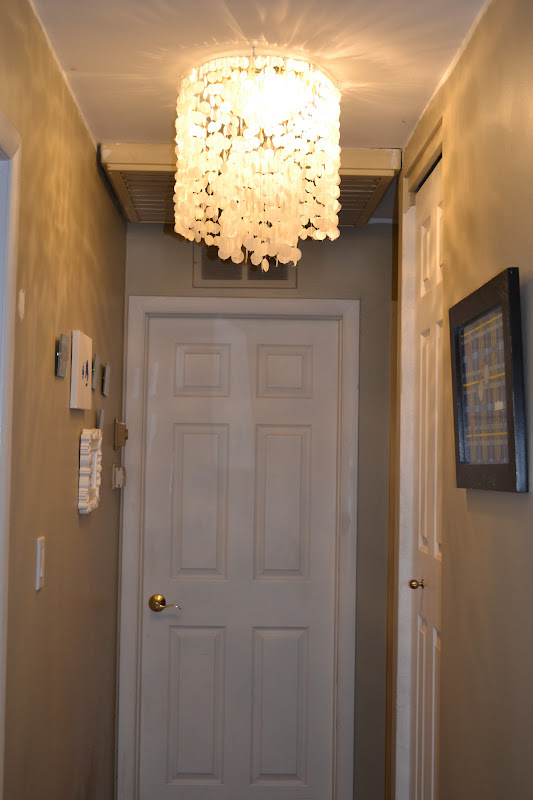 Our hallway light could be much fancier. I thought a chandelier would be perfect. They recommend using a lamp shade, so I picked one up at the Salvation Army. Next I hacked off the shade. Of course the metal hoops were not attached and were entirely too small. So I threw it away. Being as crafty as possible, I made the frame myself from extra wire I had lying around. Next I rolled out a long section of parchment paper. I layered 3 sections of wax paper atop the parchment. I topped this waxy sandwich off with another layer of parchment and ironed over the parchment fusing the wax paper into one sturdy piece. I bought this fancy circle cutter awhile back in preparation for this project. To cut a circle, you put a blade into the size of circle you want. I chose one inch. Holding the edge with one hand, the other hand spins the plastic disk and cuts a circle. It is not a simple product to use. I'm pretty sure the circles were never perfect, as advertised. It was really difficult to use and it probably took around 10 seconds to cut one circle. 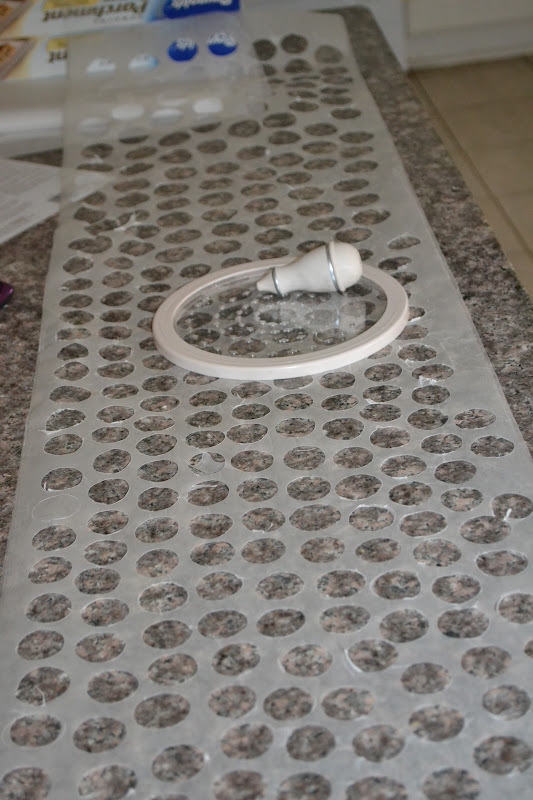 After the first four hours of cutting circles, I knew this was much more time consuming than I had ever thought. Remember how I told you I chose one inch? That was dumb. If I had just chosen one and a half inches I could have saved myself a lot of time. The biger the size, the easier and quicker the circle. I was not able to work on any other projects for the blog. This took all my time! I began to get angry. Most of the crafts and projects I work on are one day projects. This is in no way a one day project. After I was sick of cutting circles for awhile, I began sewing them together. I had to hang the wire frame in the strangest places to attach the circles. I hot glued the top two circles of a chain together over the wire. I beg you - be careful when using a hot glue gun. It really hurts when you touch glue freshly piped out of your mini glue gun. 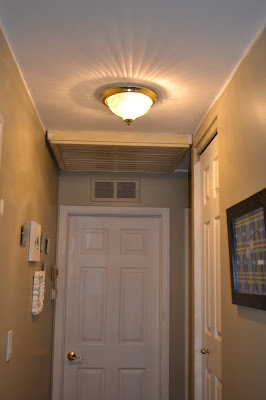 Between the counter and chair wasn't working too well so I decided to "hang" the wire frame from the ceiling fan. I was only about 50% done at this point, and this was day 3 or 4. Fast forward a million circles cut out and I'm slowly finishing up. GB hung up some ceiling hooks for me around the light. Call me lazy, but I thought we could put the frame right over the light without having to remove the original light fixture. 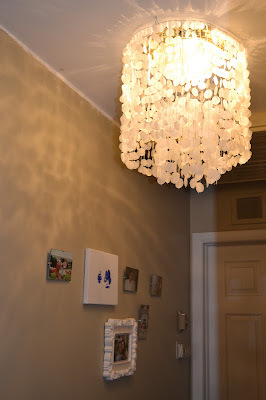 Somewhere around 1100 circles later, I have a chandelier!!! Unfortunately, you can still see the old fixture. I'll take it down and leave the bulb exposed sometime soon. I think it will look nice. But for now - I'm leaving it. I am so sick of this project I could scream. But man - that hard work paid off!!! I LOVE IT! 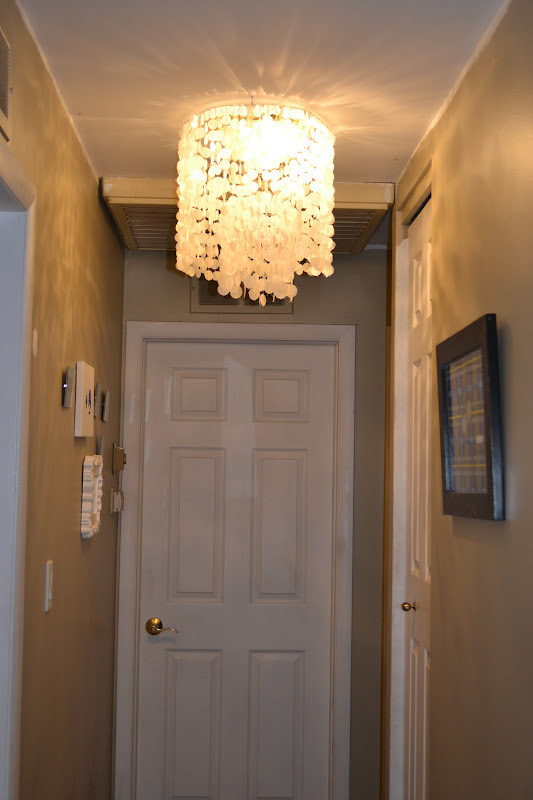 I really think it adds some freshness to our little hallway. Another added bonus - it only cost me around 4 dollars for the wax paper. I had everything else. What do you guys think? Was this little guy worth 10 hours of cutting circles? This looks fantastic. The stitching is key when seen up close, so it is something you should be proud of if anyone asks where you got it and then you can say you made it. Well done. Thank you so much! I am so proud of it! I recently sat in my living room and looked around. My home is filled with things that I have made with my own two hands. It feels great. Thanks for being such a loyal reader! I am huge fan! So much so that I want to make one myself! Thank you! Give it a try! I'll give you any tips you want! Thanks for reading! I sewed them together! Thanks for the compliment! Not sure how they would cut wax/parchment paper, but you could try using scrapbooking puches. If it worked it would make your project go ALOT faster. It looks great! I thought about that too! 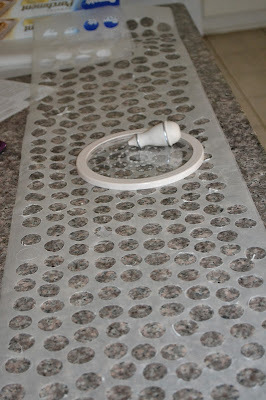 While doing research and reading all the posts from bloggers who have tried - most suggested not using a hole puncher. It would definitely be worth a try!